Bruno, the dog steals the show in an illogical half baked thriller film. A cliché thriller with lack luster screenplay and formal characterization sinks G. V. Prakash Kumar’s Watchman despite its crisp running time. Last week it was Kuppathu Raja and this week it is Watchman for G. V. Prakash Kumar. Apart from the genre both ventures do not differ much as both fails to entertain the audience. But you have to give it to the evolution of the musician as an actor, in such a short span with so many films in his kitty G. V. Prakash Kumar has definitely evolved as an actor. Bala (G. V. Prakash Kumar) is in need of money to pay back a loan that had borrowed in the past. With a dead line of 24 hours to pay back his loan he dials up to everyone that he knows but none serves the purpose of his call. Having got in a fix he stumbles up on a big bungalow. When he comes to know that the bungalow is vacant on that particular night, he makes up his mind to rob it. He climbs the wall and takes a jump and that is where our second hero of the film enters the scene with a thundering back ground score, Bruno (Golden Retriever). From there it is G. V. Prakash Kumar and our Golden Retriever that carry forward the movie. We do not get nothing much to see happening in the first half as it is just about Bala making number of failed attempts to enter the bungalow to accomplish his mission. At the interval block is where the film actually begins. Few terrorists make their presence in the bungalow that belongs to a former top police official. Are they behind him? If so what makes them come for him builds the thrilling element of the movie. First half is all about passing time and we do not get to witness anything that sets the stage for the second half. First half is all about some unasked flashbacks that test the patience of the audience in a 95 minutes film. It is quite astonishing to see the way G. V. Prakash Kumar has progressed as an actor. His maturity as an actor is evident in the film. Particularly, the scenes in which the actor travels with the dog and the way he quivers when he sees the growling dog as soon as he enters the bungalow speaks in pages about the actor’s evolution. 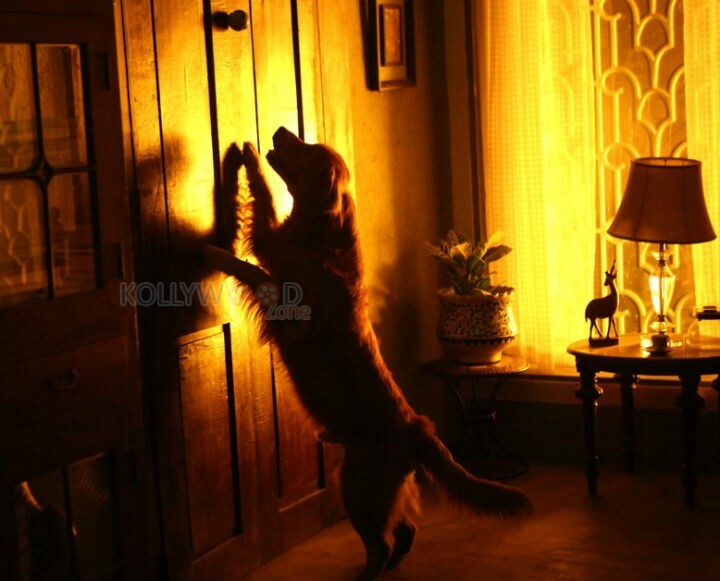 Bruno, the Golden Retriever the way it has performed in few scenes in the movie reflects the immense amount of training that it would have undergone to take up this role. We are sure it is going to take some time to witness a replica of performance such as this from a pet dog, in Tamil cinema. We hope the doggy bangs an award this season under some category. If you are a dog lover we are sure you are going to claim Watchman as a super hit movie. Yogi Babu gets a proper intro in the film but Vijay fails to make use of the comedian to his fullest. He leaves the film with just few notable one liners. Actor Suman has delivered what he was roped in for. Other than these characters rest of the characters just seemed as filler roles in the film. A cliché thriller with lack luster screenplay and formal characterization sinks G. V. Prakash Kumar’s Watchman despite its crisp running time.